Since her untimely death the day before her eighteenth birthday, Felicia Ward has been trapped in Level 2, a stark white afterlife located between our world and the next. Along with her fellow drones, Felicia passes the endless hours reliving memories of her time on Earth and mourning what she’s lost-family, friends, and Neil, the boy she loved. Then a girl in a neighboring chamber is found dead, and nobody but Felicia recalls that she existed in the first place. When Julian-a dangerously charming guy Felicia knew in life-comes to offer Felicia a way out, Felicia learns the truth: If she joins the rebellion to overthrow the Morati, the angel guardians of Level 2, she can be with Neil again. 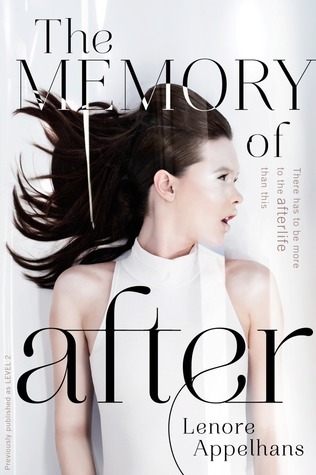 Read my review of Level 2/The Memory of After here. I really loved Siege & Storm by Leigh Bardugo. I want to go re-read it now. attrition by s.g. night was EPIC!!! In The Shadow of Blackbirds was definitely one of my favorites. I can't wait to read Cat Winters next book. Evolution of Mara Dyer by Michelle Hodkin and Through the Ever Night by Veronica Rossi. Thanks for the giveaway! Unravel Me by Tahereh Mafi. My favorite book was either Dr. Sleep or NOS4A2. So hard! but I loved The Dream Thieves by Maggie Stiefvater, In The Shadow of Blackbirds by Cat Winters, and The Pirate's Wish by Cassandra Rose Clarke! Hopeless by Colleen Hoover! It's so incredibly good! I've wanted to read this book! Thanks for offering it in your giveaway. My favorite YA books of the year (because I can't pick just 1) are Just One Day by Gayle Forman and Fangirl by Rainbow Rowell. You can read about my favorites for the year here! Can't choose between House of Hades and The Indigo Spell. I loved Sweet Peril and Unravel Me! Thanks! One of my favorites was Splintered by AG Howard, thank you for the giveaway. I loved Made of Stars by Kelley York. I would have to go with The Clockwork Princess or the Eternity Cure!